I love mums! I never used to. It's really odd. But now? Now I LOVE THEM! 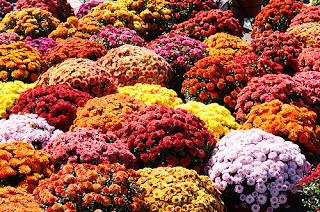 I love the fall colors, the big blooms, and the fact they last forever and are CHEAP! I just grabbed 6 3qt potted mums and 4 1qt pots for less than $40.00. I have the large ones on my porch steps, and the small ones I transplanted to a large container in my yard. I may get around to snapping some photos after I am finished with all of my fall decorating. FALL FALL FALL!!!! YAY!!!! I'm only a little excited! HAHA!